Veronika Wild: Don’t spoil our Mountain! There’s another big stoush brewing in Hobart. This time it’s about the proposal to put a cable car up Mt. Wellington. This mountain (1271 m) overlooks most of the city and is its most distinctive landmark -on a par with Tokyo’s Mt. Fuji or Bali’s Gung Agnung. The main objection by residents is that the proposed route runs directly across its face and across the “The Organ Pipes,” one of its most impressive features, thereby spoiling the view for everyone – tourists and locals alike. I mean would the Japanese tolerate an intrusive manmade structure on Mt. Fuji, despoiling that picture postcard look? I don’t think so. Mt. Rushmore has a chairlift but does it run up the face (s)? No. It provides much enjoyment some two miles away from the historic monument and is no less popular for that. This is our Mt. Rushmore. One of the things which impressed me in many places in Asia, was that despite cities being very crowded and devoted almost entirely to economic activity with little regard for urban planning or aesthetics, the mountains were largely inviolate with only the occasional ancient temple to interrupt the forest cover. For many people, including our Aboriginal people, mountains have spiritual significance and even people without a shred of spirituality, still go to the mountain to commune with nature, not concrete and steel. Except for a lady with a pram, I have rarely heard anyone complain about the two minute walk from the Carpark to the summit. 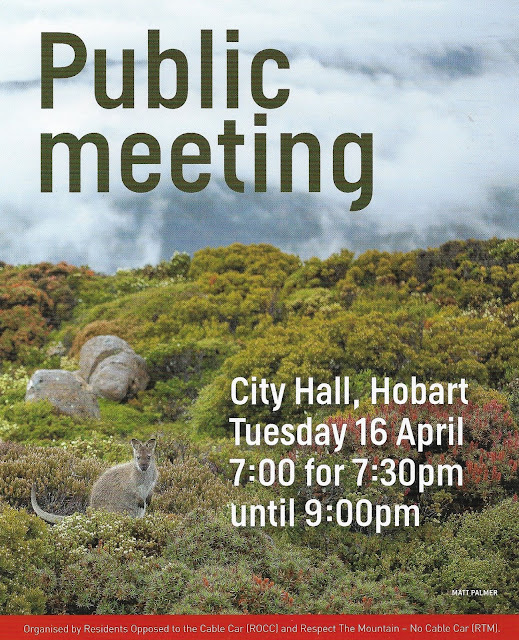 One of the major reasons people visit Tasmania -and bring in far more tourist dollars than those which have been promised by the cable car company, is precisely because the ratio of nature to people and built structures currently favours nature. A cable car up the front of the mountain would immediately challenge that perception. Not that I am personally opposed to cable cars as such. I have seen some that fit in rather well -for instance those in Valparaiso, or the one that takes you to the Royal Palace in Budapest. Both of these are relatively urban, blend into their surroundings and do not offend the eye. Those at Mt. Elbrus in Russia, come in both kinds. The upward journey over three cable cars is of the in- your- face kind, but runs over neighbouring foothills, while the downward journey takes you down the back of the mountain, stopping halfway at a service centre with restaurants and souvenir stalls, and then proceeds gently downhill around the the mountain under tree -cover to the bus parking area. I’m sure that if a cable car could be built discreetly and in sympathy with the environment and the sensibilities of other users, both groups could be satisfied. What is far more offensive in my view, is the way our state government has ridden roughshod over the wishes of its citizens and their local councils and virtually given a private company carte blanche, without allowing for adequate consultation with those who will be most affected. This is after all the People’s Park. They should not be bullied into accepting major changes to their skyline. 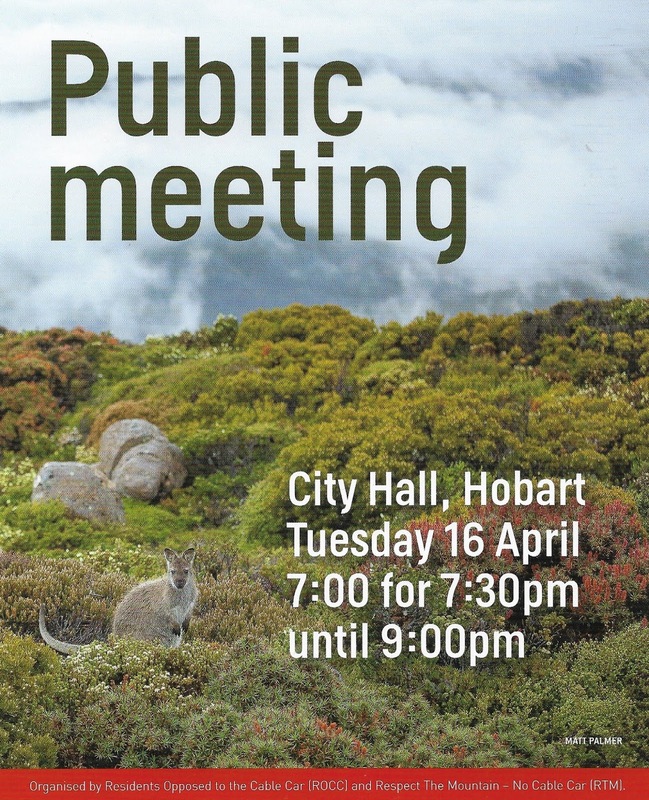 Spectacular as this vew is, no private company should have the right to control the summit, especially not in a public reserve that belongs to all Tasmanians. Nor should it be open to commercial exploitation.